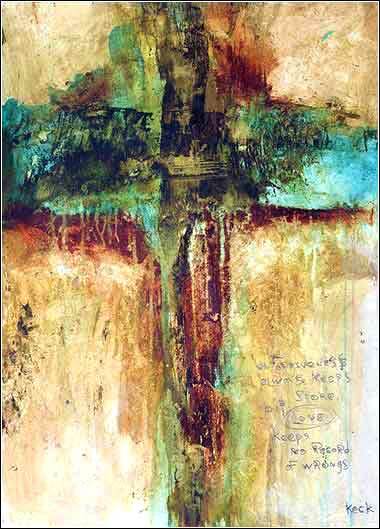 Cross by Michael Keck, contemporary. Ecclesiastes (not to be confused with EcclesiasticusEcclesiasticus is an alternate title for a deuterocanonical book (in the Protestant Bible, part of the Apocrypha) better known as the Wisdom of Sirach, a wonderful book more similar to Proverbs than Ecclesiastes, but written too late (@ 200-150 B.C.) to be included in the Jewish canon.) like the other four “Wisdom” books of the Bible, is one of a kind. 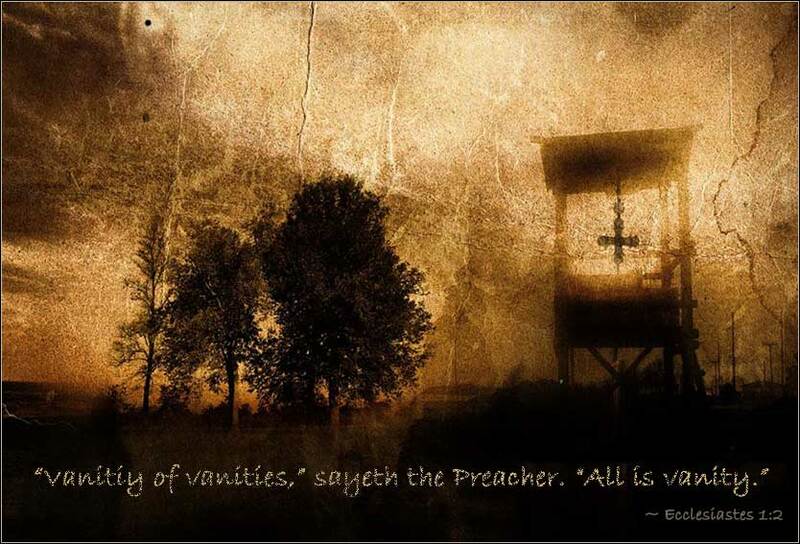 It is attributed to Solomon, who is identified as the author in verse 1 under a pseudonym, “the PreacherThe Greek word from which the title is taken, “ecclesiastes”, means a person who addresses a congregation or assembly. The word in the Hebrew Bible (Koheleth) means “one who gathers” and was used to refer to a teacher.”. The beautiful opening poem — possibly the best part of the book — is a condensed thematic statement of following 12 chapters, expounding a nihilistic philosophy. “Vanity” is used to translate a Hebrew word with a wide range of meanings, such as “breath”, “vapor”, and “nothingness”. The body of the book alternates between two apparently contradictory themes. First, that everything we are and everything we do is transitory, repetitive, and ultimately forgotten. The theme (which, in theological terms, treads perilously close to Buddhism) has formed the basis of numerous artistic works, from pop music — notably “Dust in the Wind”, a 1977 hit by Kansas — to some of the best-known English romantic poetry (e.g. Ozymandias by Shelley and Keats' Odes), and became very popular among various 20th-century philosophers. The second theme reminds us of Greek Epicurean philosophy: that we should enjoy the good things in life, even though they have no ultimate meaning, for that is all we have. These “good things” range from virtues, such as wisdom, to the enjoyment of friendship and a good meal. These verses seem abrupt and disconcerting. They present a diametrically different concept from the text, with no preparation. One might speculate that they were tacked on, to rescue Ecclesiastes from the dustbin of heresy. Yet they do sound like Solomon's thoughts. As we know from other works, Solomon was far ahead of his time in his anticipation of aspects of Christian theology. He was by no means a messianic prophet; the coming of a Redeemer does not figure in his work. But even so, he seemed to gaze ahead to a time of ultimate judgment by God, along with mercy and forgiveness for those who believe in Him.